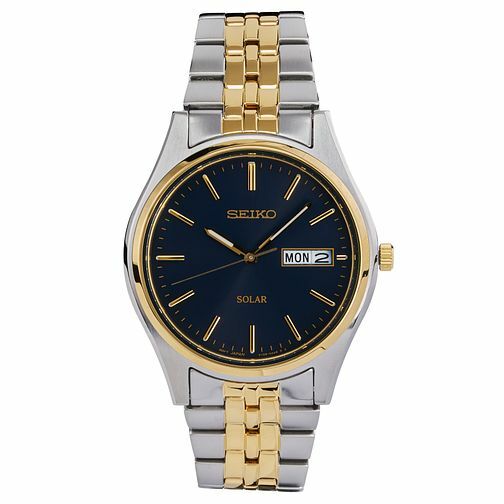 A classic two tone men's design Seiko featuring modern black round dial with date function. A stylish watch for everyday style. Seiko Men's Two Tone Black Dial Bracelet Watch is rated 5.0 out of 5 by 1. Rated 5 out of 5 by Anonymous from Seiko Quality I bought this watch a year ago after having another Seiko Quartz watch since 1977 which is still working perfectly. The Seiko Solar is well made and has an excellent appearance. The watch has been left without light for weeks on end and keeps working, so the battery holds a charge for a long time. It has a completely black face which shows no indication of being a solar panel for the battery. The hands stand out clearly against the face and are luminous for a short time in the dark. The clasp is easy to use and secure. I would recommend the watch as good value and I'll write back in 37 years to let you know if it's as long lived as my first Seiko.